The Mitas PneuTrac concept farm tire is closer to reality following recent field testing. 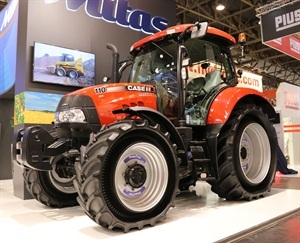 Visitors to the 2015 Farm Progress Show got the chance to see the tires, mounted on a Case IH Maxxum tractor, at the Mitas Tires North America Inc. booth. The front and rear axles of the tractor were fitted with size 480/65R28 and 600/65R38 tires, respectively. The 28-inch size is new. Besides the footprint, Mitas is also measuring the traction force of its PneuTrac concept. The slippage and traction force is measured under several modes of driving, and the result is the evaluation of traction force under the slippage that normally occurs during regular farm work. Testing, size 600/65R38: The results show the traction force of the PneuTrac is approximately 25% higher than a standard tire, according to Mitas. Compared with an IF-rated tire, PneuTrac delivers approximately 15% better traction. Testing, size 480/65R28: PneuTrac has approximately a 10% advantage in traction force over a standard tire, and a 7% advantage over the IF tire. “The most important PneuTrac benefits are a larger footprint, greater tractive force and also higher lateral stability at a lower inflation pressure when compared with the standard tire,” added Mabin.